When you come to Amsterdam you need a place to live. For a short period of time you can choose to take up residence in an hotel. But if you are planning to stay for a longer period, you have two options; renting or buying. In both cases, expats should keep in mind houses in Amsterdam are not very large usually. The majority of housing consists of apartments and row houses. 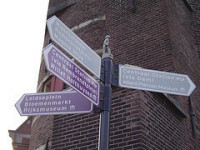 Nevertheless, also semi-detached and detached residences can be found in Amsterdam if you have the budget. A big difference between renting and buying: rent is not tax deductable but mortgage is. Rent or buy a home in Amsterdam? When you have a nice dwelling in mind, the rent amound is a matter that might effect whether a housing permit is required. If you choose to buy a house you have another choice; a newly build house or an older house. New accommodations and accommodations under construction can be found on the Dienst Wonen website. In both cases you have to arrange a couple of things. More about this subject you will find on this page.